Sit up, and the world will notice—or at least that’s what grandmothers around the world remind their children. Sitting upright with good posture communicates confidence and good manners, but beyond that, better posture holds a multitude of benefits for the body. For example, did you know your energy efficiency increases when you regulate your breathing, which can result naturally from sitting up straight? Most of us probably don’t think about our posture much, but it’s well worth it to make the conscious effort to improve your posture. Here are 10 less commonly known health benefits of better posture. Feel a little woozy or strange when you sit up after an extended period at a desk or lying down? That’s because the blood rushes through your body to adjust due to poor posture.The long-held bad pose fatigues the muscles and reduces the ability of blood vesselsto supply those muscles with blood. Good posture improves blood flow. Look at a few photos of yourself that reveal your posture. Or get a friend to take a natural picture of you when they notice your “typical” posture. Then, take a photo of yourself with better posture. Sitting upright aligns your bones and makes you look healthier and less slouchy like Eeyore! You’re also more likely to make eye contact with someone because your body’s not slumped downward, which can help you feel more confident to engage with others. Researchers say if you sit up, you will notice your mood enhance, too. Improve your levels of joy and energy by sitting in a more upright position. Poor posture can make you feel more depressed and stressed. While bad posture doesn’t cause depression and anxiety, studies show it can worsen the effects of the symptoms on the mind and body. Mindfulness practices focus on breathing and posture for good reasons. Upright posture and an aligned spine help the chest and lungs to take in air. Which helps with circulating oxygen to your brain and major organs. Again, better breathing is good for the body because it allows more oxygen to spread throughout the body. One study found that tilting your chin upward with good posture increased oxygen flow by 40 percent to the brain, effectively boosting concentration. Those who slumped in the study tended to recall negative memories more easily. Good posture aligns your spine and muscles groups to work together. You improve your balance and reduce your likelihood of getting injured. Want to achieve better balance physically, too? Pay attention to your posture. Feeling worn out? Fix your posture to get a natural energy boost since poor posture is associated with fatigue and reduced ability to move a misaligned spine or perform work efficiently. Continued sitting for long periods puts your body at increased risk for repetitive motion injury, and better posture helps you prevent that. So, if you sit down for eight or more hours clicking a mouse, you may be more at-risk than a waiter! Add a pillow to your desk chair and adjust it so your hips align with your knees or come up a little higher. Whenever you hunch over or slouch, your muscles near your neck, spine, and tailbone, take the brunt of the pressure, and you can stress out these muscles. That’s why your shoulders and neck are always tight — avoid back injuries by sitting upright! Ever heard of text neck? Your head weight becomes 27 pounds when you lean 15 degrees, or 40 pounds at a 30-degree tilt. On average, the head is 10 to 12 pounds, like a bowling ball. So when you hunch over your phone at a 60-degree angle, you bear 60 pounds on your shoulders! That severely strains your bones. Good posture will help prevent text neck and bone wear because you remove abnormal bodily stress, which can stress your joints. Over time, bad posture decreases your range of motion, or how far your joints can move in a given direction. Tight chest muscles lean your shoulders, while shortened tight hips tug the upper body forward. This all leads to bad posture. When you sit up regularly, your range of motion increases and improves. 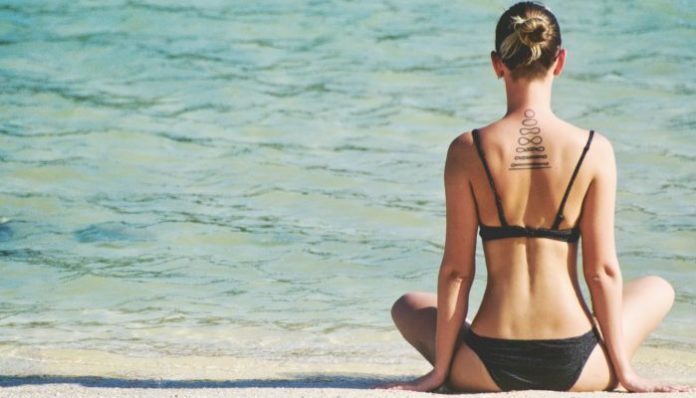 So, what does good posture look like? As you sit, keep your chin evenly aligned and horizontal to the floor. Your knees, hips, and shoulders should be even, and your weight equally distributed into both feet. Think tall. Think confident!